Welcome! Thank you for your registration. In case of inclement weather, participants are advised to wear layers and bring a rain jacket. Boat shoes, soft-soled shoes, or sneakers are best. Parking is available at the Navy-Marine Corps Memorial Stadium and free buses shuttle attendees from the stadium to the sailboat show downtown at the City Dock. Buses run continuously from 9:00AM until one hour after the sailboat show closes. Stadium parking is $10.00. Take Route 50 to Annapolis/Rowe Blvd (exit 24). Follow signs along Rowe Blvd. to the Navy-Marine Corps Memorial Stadium at 550 Taylor Ave in Annapolis, Gate 5. The stadium’s GPS Address is 550 Taylor Ave, Annapolis, MD 21401. Meet at the National Sailing Hall of Fame for the classroom portion of your sailing workshop. Follow the First Sail Workshop signs near the entrance to the Annapolis Spring Sailboat Show (1 Dock Street, Annapolis, MD 21401). Participants will learn the basics of sailing in a 45-minute classroom session, immediately followed by 90 minutes on-the-water with SailTime and American Sailing Association instructors on the Beneteau First 22. Please plan to arrive a few minutes before your scheduled workshop. Please retain your printed ticket and boarding pass after checking in at show entrance or the National Sailing Hall of Fame. This will serve as your boarding pass. 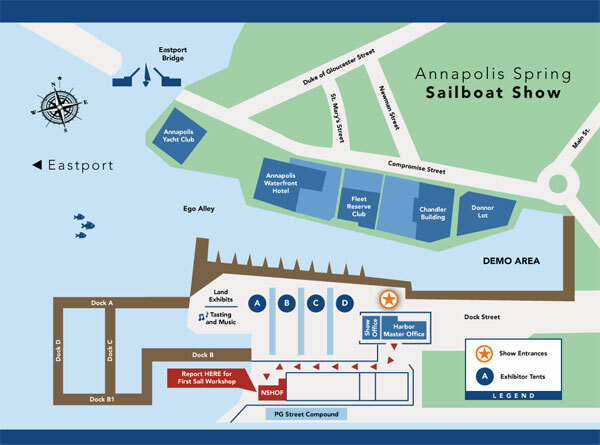 Admission to the Annapolis Spring Sailboat Show is included with your First Sail Workshop registration. If you have any questions contact us at 410-268-8828.